Ken Takakura passed away recently, and since it was well-reported on TV, in the newspapers and weekly magazines, I assume everyone knows. After his death, it seems there is a revival of interest and recognition of his greatness as a film personality. I saw many of his movies including "The Yellow Handkerchief" and "Poppoya". The heroic films where he declares that he will die and the last scene of "The Yellow Handkerchief", with so many bright yellow handkerchiefs fluttering in the breeze against a pure blue sky remain in my memory. 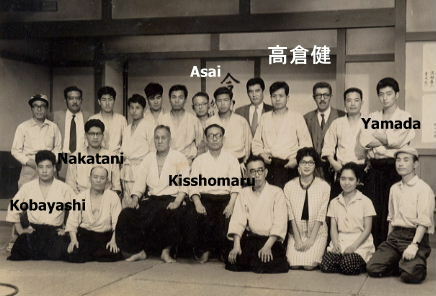 In the spring of 1960, Kisshomaru Ueshiba sensei told me that a movie involving Aikido was being made and that I was to teach the actor, Ken Takakura. For one week, everyday from 2 to 3 pm, I taught him. No one came with him. Ken Takakura brought the script and showed me photos he had of Aikido techniques, asking if we could do similar movements, so I thought of appropriate techniques and took ukemi for him. He was, after all, an actor, and as I very well recall, I only had to demonstrate a technique two or three times and he could do it properly. Mr. Takakura was born in 1931, which made him five years my senior at Meiji University. 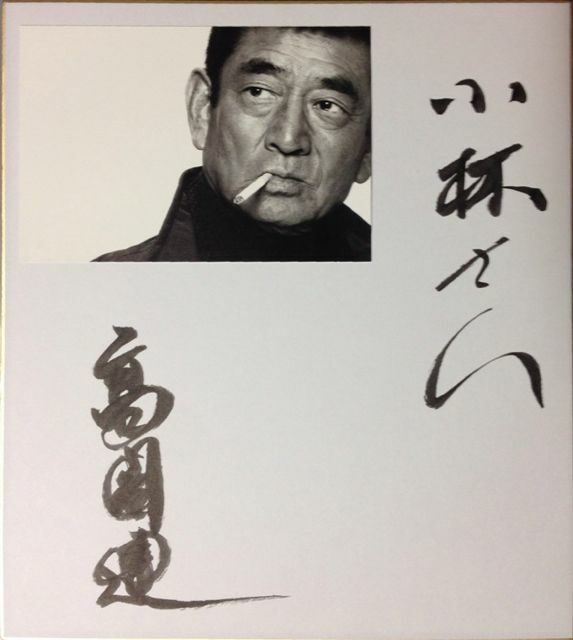 He became an actor for Toei films in 1955, the same year I enrolled in Hombu dojo. His career was just taking off, as was Hombu dojo, so it was easy to accommodate him with personal instruction. I have a photograph of Morihei Ueshiba O-sensei with Ken Takakura taken in the old Hombu dojo. If you look closely at that photograph, you can see the tatami we old and ripped, so you know it's the old Hombu. Sitting next to O-sensei is a beautiful, young actress, so there were lots of photos taken. This is slightly off the subject, but at that time, there was no car at Hombu dojo, so O-sensei would go back and forth between Hombu and Iwama by train on the Joban line, accompanied by uchideshis. The uchideshis’ best job was to scout out a four-person box seat where three pretty young women had already taken seats. O sensei would then sit in the last seat and chat with them saying "If only I weren't an old man..." The other uchideshis, my seniors, my juniors and I would sit to the box aside to it and get our fair bit of rest. That was a key to curing our lack of sleep. The title of the movie was "Tenka no Kaidanji: Tosshin Taro". The actress Toshie Kusunoki played the role of the dojo master where Ken Takakura's character was an assistant instructor. I can't remember much about the plot. When you look at the photograph on the set at Toei, you see the actors and actresses, Yamada shihan (America), Asai shihan (Germany), Sugano shihan (America), Nakatani shihan (Brazil), Wakabayashi shihan, Sato shihan, and me. In the photograph from the set, the tatami aren't torn. They took photographs of Hombu and created a set that exactly reproduced the old Hombu dojo (except for the ripped tatami). After the training and the movie, it was written in the sports newspapers and the weekly tabloids that Ken Takakura was an Aikido 3rd dan. From that time on, that story just kept going, so Ken Takakura is remembered as a 3th dan. I never had a chance to meet him again, but at the 50th anniversary of the Meiji University Aikido Club, an OB who was an acquaintance of his brought me a gift (see photo). I pray for his eternal peace and happiness.